It’s not like it stuck around or anything, but yes, snow was seen falling from the sky today! Hopefully that’ll be the last of it for this winter, but we’ll see – there’s always a few surprises in spring weather. 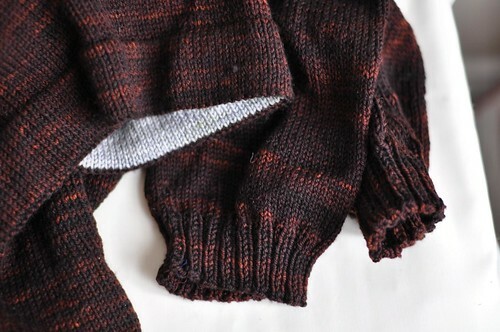 The other day I was looking through one of my “assorted projects and yarns” bins and came across a long, long neglected sweater – I think I started this several years ago and for some reason, I just didn’t finish knitting it! It only had one sleeve left to go! Since it’s been so long, it’s almost like I got to knit a new sweater and finish it up in 2 days. 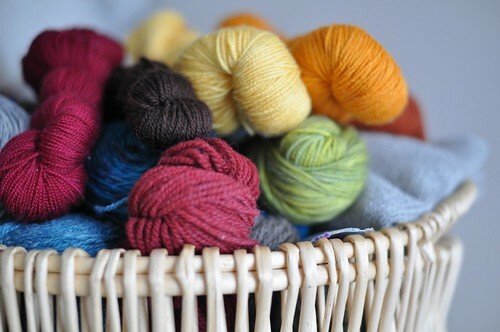 The yarn is Handmaiden Casbah – it needs a good bath before its debut. Might be a good one to take with me to the UK too. More brown – I started this shawl a few weeks ago, and although I don’t get to work on it much, I do think it’s fun! It’s a triangle, worked from the bottom up. So the cast on is very long (over 300 sts) but you start decreasing right away. I’m using Spud & Chloe Fine, and there will be more colours than just these two. 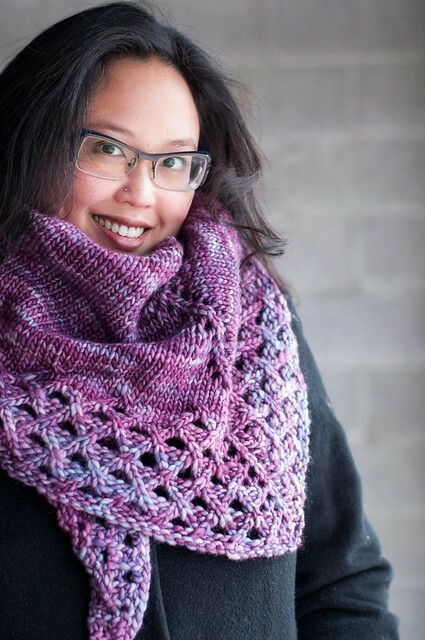 I love this yarn, and especially in this stitch pattern it’s really springy and squishy! What knitting do I bring?! Wishing you a great trip, enjoy it very much! Defintely add it to your packing our sesaons are not so clearly defined as yours. The last week has seen high temps for April, but as the saying goes ‘don’t cast a clout ’til May is out’. That is always the hardest part about packing. I don’t know what the baggage rules are for the airline you’re taking, but I used my additional checked bag for yarn :) I had way more than I needed, and it held me over when I lost my license and couldn’t rent a car to visit any LYS’. I found the rule of thumb to be pack more than you think you will need. Better to have too much yarn than be yarn deficient. Being yarn deficient has caused me to knit weird stuff. I always knit socks when I travel. It is easy to pack yarn for several pair and they often end up on my feet before I get home!